One of the most effective marketing tools that can be deployed in any organization, be it large or small, is the business card. Why not take it a step further, by handing out these fantastic CD business cards instead? We print directly onto the surface of this versatile media, so you can have your phone number, fax, email address, web site and mobile number all included in the design — just like a conventional business card. CD business cards are obviously meant to carry data too though, and by cleverly having the same rectangular dimensions, it is now possible to carry valuable company information on a CD business card. A very powerful medium indeed. Measuring 85mm x 61mm it can easily fit into any potential client´s wallet. The list of useful information that can be put onto a CD business card is a long one. 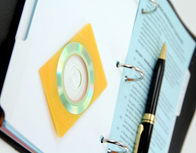 Product catalogues, price lists, presentations, brochures, portfolios, your website, reports, business introduction videos, music demos… all on a discreet little CD business card. At just under 50MB there´s certainly enough room to store any of these marketing ideas, and being lightweight and durable, CD business cards are ideal for posting too. At Duplication Station we are proud to say we have helped many businesses increase their customer enquiries due to them distributing CD business cards that we have supplied. As mentioned above, it´s possible to have your website burnt onto a CD business card and distributed as a direct marketing tool. Just think about that for a moment. A whole seo industry has evolved out of trying to get people to find websites. But with a CD business card you can do it the opposite way round; Make you website go to your potential clients! This is a powerful enough prospect when handing over a CD business card in a one-to-one situation when meeting a new customer. But what about attending trade fairs, seminars and conferences? By handing out your CD business cards to what could easily add up to hundreds of people, you could vastly improve your site visits. 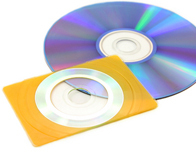 We can also supply CD business cards as pre-printed blank media for you to burn your own data onto. Having your own corporate branding or logo with space on the CD business card surface to add your own text (for example software version numbers) is useful if you have data that´s constantly changing or upgrading. Finally, don´t worry if a CD business card doesn´t have enough storage space for you. We also provide the DVD variety too! They offer 330MB of space which is large enough for even the most demanding of data. And of course, they look exactly the same as a CD business card.